Following this year's successful bid to rename a Brooklyn playground Adam Yauch Park, fans of the Beastie Boys are now pushing for a Lower East Side street corner displayed on the band's iconic Paul's Boutique LP to be rechristened in its honour. An online petition is now circulating requesting that the intersection of Manhattan's Ludlow Street and Rivington Street be renamed "Beastie Boys Square." This is the same street corner where the 1989 LP's album cover was shot. Sadly, a fire in 2011 decimated the building shown on the cover art, which was being run at the time as the Three Monkeys restaurant. The petition was whipped up by local man LeRoy McCarthy, the same rap fan who was seeking to have a Brooklyn street corner redubbed "Christopher Wallace Way" in honour of the late Notorious B.I.G. 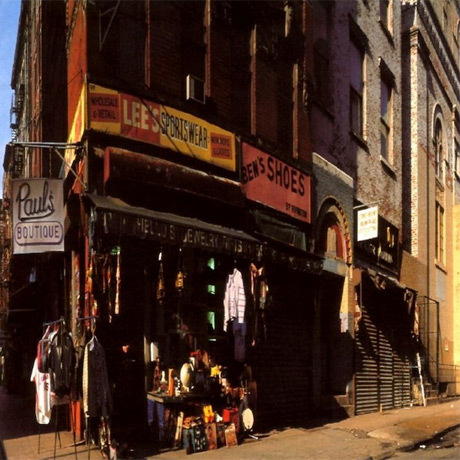 Of Paul's Boutique, McCarthy noted that the cover photo and the music on the album captured "the vibrancy of the ever-changing life on the streets of NYC." "The album, released July 25th 1989, was groundbreaking, and it encompassed these Boys from NYC, rapping about life and times from their point of view," he wrote. "Because of the album cover photo, and the Beastie Boys were ever-changing NYC artist, the location of Ludlow Street and Rivington Street would be a great place to honor Beastie Boys with a corner co-naming." At present, only 142 of the 10,000 needed signatures have gone to the cause, so all you ladies in the place, rump-shakers, high plains drifters and assorted egg men in favour of the name-change may want to head here to lend your support. McCarthy will introduce his proposal to Community Board 3 and City Council sometime in January.